He's cool, debonair, and in love. That's right! Riley Moose is laid back and ready for romance. lol What more could his beloved ask for? Hmm, I'm not sure. 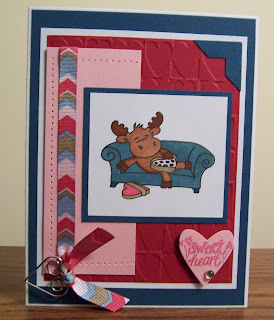 But to show off Riley Moose Valentino's (my nickname for him) mellow side, I created this card. Among the elements I used include: American Crafts ribbon, SU cardstock, Cuttlebug heart folder, and Copic markers. With Valentine's Day quickly approaching, you are likely to see other cards with this cute image. If you want to add it to your stamp collection, surf on over to Hanna Stamps. You did a fabulous job on this, Michele....I love your coloring and what a great layout!!! Thanks for visiting my blog and leaving such a nice comment! !